Does the world need another PMP? Isn’t the iPod the end-all-be-all there will ever be for potable HiFi? Â Can something be made that will ever displace the iPod position at number one? Â Questions need answers and the HiFi enthusiast shouldn’t be limited to our dark dens and hundred thousand dollar music rooms. We deserve great sound on the go. Companies like Wadia Digital and PeachTree Audio have been developing products that make up for the iPod’s lack of HiFi sound by circumventing the iPod’s DAC and taking the digital files straight out like a transport. Â But these transports aren’t portable. Â They still need a system to hook up to, and they don’t fix the problem at the source. Â The iPod. So in steps Fang Bien, a young HiFi enthusiast studying Nanotechnology in New York City, where apartments are small and public transit is a constant. 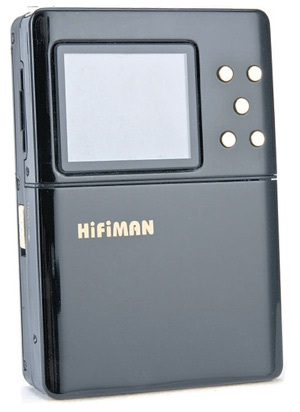 Â Influenced by the look andÂ convenienceÂ of Sony and Awia cassette players he used to collect in China, Â and his own passion for high fidelity, Fang created the world’s first portable HiFi music player, the HiFiMan HM-801. What makes the HM-801 a true HiFi portable music play? Â Doesn’t the iPod and other PMPs already play lossless files, isn’t that HiFi enough? Â No. So what is it then that separatesÂ the HM-801 from the rest of the PMP community. Â What makes it HiFi while the rest are just consumer grade? First off, it has a huge battery that provides enough power to reproduce dynamic, detailed Â and balanced sound across the spectrum. Â The HM-801 can drive a wide variety of high end headphones. Â Not just the run of the mill $30 earbuds, but some trueÂ referenceÂ cans. Secondly, and most HiFi indeed, the HM-801 uses the Burr-Brown PCM1704 DAC. Â This is a step so far above all other PMPs that one wonders why it took a student of Nanotechnology to make it? Â The HM-801 guts are made of real and well respected DAC chips from a real HiFi oriented company like Burr-Brown. Thirdly, the HM-801 will play a hugeÂ varietyÂ of Â codex formats including 24bit/96kHz files. Â Put together power, a high quality DAC chip set, the ability process 24bit, and you’ve got the HM-801 portable music player. Â A true HiFi PMP. So, to answer the question, does the world need another PMP, yes it does, and here it is. And it gets even better. Â With the HM-801 you have the ability to change out the amplifier to a different chip set to tweak the sound out of the system. Â Sure it already has a EQ if you’d like to use it, but you can change the amplifier, like you can change the amplifier in your home system, to tweak the sound. Fang created a modular bay named the GanQi Bay which is easy to open and replace the amplifier chip set. How awesome is that! Â As well the battery and SDHC memory cards are all removable and replaceable. Â This thing is completely modular unlike the prolific iPod. Â You aren’t locked into the size or limitations. Â You’ll never run out of room, and with two batteries you’ll get about 16hrs worth of play time. Unfortunately it isn’t all sunshine and flowers with the HM-801. Â There are some weeds growing in this garden of Eden that I hope in time will beÂ whacked. Â For starters, and probably the most disappointing, to get 24bit sound from the HM-801 you have to use the coaxial in line. Â So the DAC will process 24bit, but not from the HM-801 itself. Â So in reality it doesn’t play 24bi files. Â It will down convert them to 16bit. Â This is a ratherÂ disappointingÂ reality check. Second, the HM-801 itself and its interface is clunky, though on the plus side it is easy to use. Â Not very ‘intuitive’ like a iPod. (If those are reallyÂ intuitiveÂ - I couldn’t figure one out the 1st time I used one – so I’d say they aren’t) Â The size of the unit is about the same size as an old portable tape cassette deck. Â Which means yes, it isn’t as easy to port around as an iPod. Â But I don’t think the size is truly an issue. Â I dare anyone to tell the difference between a 16bit audio file and a typical high resolution MP3 file while running, or on noisy public transportation. Â As in, this maybe a PMP, but to get theÂ benefitsÂ of the sound you have to be somewhere quiet and paying attention. Â So who cares if it is as large as an old tape cassette. Â It is still smaller than your CDP, DAC, Pre, and Amplifier put together. The third strike is that it doesn’t have enough power to drive cans like the AGK K701 to aÂ satisfyingÂ volume. Â Yes it sounds good and full, and does what it should, but not very loudly, and not very dynamically. Â Maxed out it is at a comfortable volume. Â And yes, of course, volume is subjective, but four friends asked if I could turn it up, to which, I said, I couldn’t not. And finally, it cost $800. Â Which isn’t all that much in the world of HiFi, but it might be a bit much for what boils down to a great sounding but clunky 16bit PMP. Â If on the other hand you consider it as a portable source and DAC, $800 isn’t that pricey at all. Hopefully all these are issues will be worked out. Â Â Remember, Fang is one guy who is going to school for Nanotechnology. Â He isn’t Apple, with legions of developers, designers, testers. And he doesn’t have the infrastructure and capital to make anything they dang well please. Â Fang is limited by resources, time, and money. Â And with in those limitations I’d say he has made one hell of a great step forward for PMP and HiFi. Â And I applaud him for it. So how does it sound? Isn’t that the real question after all? First off, it does sound much better than an iPod. Â When driving a set of decent cans it is detailed across the spectrum. Â The high end is open, very fast and very clear. While listening to Dragon Force’s Sonic Firestorm I actually heard both guitars in great detail. Â And this was with VBR mp3s. Â I was very impressed. Â With the K701s The low end is detailed but not full bodied. Â It actually reminded me of some KT88 driven tube amplifiers. Â Great detail, but isn’t going to rock a house party. Â Larger dynamic shifts are good enough to get more than just the idea across, but with classical, like Heifetz playing Tchaikovshy, it isn’t attention grabbing and stunningly powerful. Â The stage is a good size and round size andÂ instrumentsÂ are well placed without too much air between them. Â The music remains focused and clear even with complex pieces and layers of sound and distortion. Â Right out of the HM-801 and into a good set of can it really does sound fantastic for a PMP. Â But the sound does, at least with the K701Â referenceÂ cans, not sound as natural or robust as I’d like it to be. Â This is probably a power issue. Â The K701s are hard to drive, and even with the bigger battery, the HM-801 on its own can’t keep up. Stephen Mejias, Steve Guttenbery and other in the Â media who has heard the HiFiMan agree, it sounds way better than an iPod. And of course it better, it is $800 after all and uses a real DAC. Â But at this price point, and with all it’s otherÂ functionalities, does it sound good enough to replace your CDP or CPU as a source? Â I’ll get to that question later. Something better than you started with. Â Which is what we would want,Â obviously. Â I plugged the HM-801 into the KingRex HeadQuarters and Trend Audio PA-10 Tube headphone amplifiers using a Sjofn Supra Y-splitter cable. Â The sound was engaging, full, more dynamic and better detailed. Â Good sound was made much better. Â The HM-801 as a headphone amplifier source is well worth it. Â Which is probably all I can write on this because there are so many different amplifiers and they all sound different. Â I suppose the main point is that if you want the best sound from an HM-801 with set of can that take some power to drive, get a headphone amplifier. But I can offer some direction for pairing a headphone amplifier with the HM-801. Â If you like a fuller low end and slightly warmer sound, pair the HM-801 with something that might lean a little heavier in that direction than you are used to. Â I feel the HM-801 can be a bit lean. Â With the KingRex HQ the sound ended up being almost perfectly balanced. Â The headphone amp tends to be thick. Â So the pairing balanced out. Â If you get a headphone amplifier that tends to be more lean in the low end you’ll only double up on what is already coming out of the HM-801. Â Granted this all also boils down to what headphones you are planning to use. Â So pair wisely. Â At least, in this case, you can totally take your source to a local hifi shop or a CanJam to demo.